I remember reading “The Beach” by Alex Garland before it became a movie and before I ever took a backpacking step in anger. The author skilfully conveyed that magic feeling of discovering a secluded or secret place. My mind’s eye was transported to the lazy island shores of a land that I had yet to set foot in. The giddy moment when the beach itself was finally discovered managed to capture that child-like feeling of being the first to find something special. This is how you will feel when you first emerge from the woods of Killarney National Park on to the sands of Rosie’s Beach. The first time I came across Rosie’s Beach in Killarney (or the ‘secret’ beach as many locals call it), I did have that goosebump moment that accompanies the discovery of a special new place. It’s not so much that it is particularly spectacular. Being nestled in a quiet, sandy inlet on Killarney’s Muckross Lake, it has plenty of nearby competitors vying for the plaudits for scenery, serenity and beauty. After you visit, I think you’ll agree with me that regardless of the reputation of its more famous neighbours, it’s worth straying off the beaten track to spend some time on the sand of Rosie’s Beach. The Muckross & Dinis loop is right up there with the best of the trails in Killarney National Park. 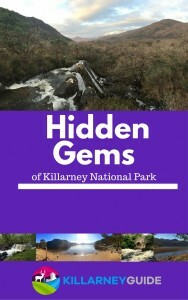 It features some of the iconic sights of the Killarney area including Muckross House & Gardens, The Meeting of The Waters, Dinis Cottage and much, much more. To find the secluded Rosie’s beach, we will be following the main loop around Muckross Lake which forms part of the Arthur Young Nature Trail. The paved trail can be walked or cycled, there are a few little ups and downs in places to get the blood flowing, but overall it’s not too strenuous. Use this map from ActiveMe.ie to guide you around. This quiet little beach was reputedly one of the favourite haunts of Elizabeth Rose (Rosie) Vincent when her family were owners of the Muckross Estate in the early twentieth century. It is not hard to imagine this being the scene of many a summer picnic or a paddle in the lake for the young Rosie. The point at which we need to exit the trail to get to the beach is in the ‘blink and you’ll miss it’ category. About 1.5km from Muckross House, there will be a section of the trail where the Park opens up a little on your right hand side. You may catch a glimpse of Doo Lough over the tall grass if you are cycling. Here’s where you need to be careful and look out for a faint sign of a path through the grass leaving the main path on your left hand side. There is a more prominent viewing point with a bench just beyond this so just back up a little and have another look if you see this view. It’s not this one ! Once you have picked up the trail, you simply follow the woodland track for a few minutes. If you are cycling, you may want to leave your bike at this point and continue on foot as the woodland terrain may require you to lift your bicycle over fallen branches or the like. Before you know it, you will have arrived. The delightful little beach is perched slightly below you with Torc Mountain rising high on the opposite shore. Guarding the beach is an old Yew tree with its root clinging on to the limestone shelves. Elizabeth Rose Vincent lived at Muckross from 1915 until the death of her mother, Maud in 1932. Following her mother’s passing, Rosie’s father and grandfather donated the entire Muckross Estate to the Irish nation. As a result of this generosity, we can all now enjoy a visit to ‘Rosie’s beach’ – Let’s hope it’s still there to be enjoyed by all in another hundred years. Thanks for leaving the comment and I’m delighted you found the beach! It’s a very special place indeed and well worth exploring!